As developers, we want our users to have buttery smooth experiences when using our application. When it comes to UI performance, a buttery smooth experience can be defined as a consistent 60 frames per second(fps). That means that we have to render a frame every 16 ms to achieve this experience. You can exceed the 16 ms time to render a frame occasionally, as there are often one or two buffered frames ready to go. This gives our whole frame process a little less than 16 ms to fully draw a frame on the screen. If a frame is dropped or delayed, it is known as Jank. Have you ever had an experience like this with your application? Your scrolls are very choppy and your UI doesn’t seem to be that responsive. Credit: Doug Sillars https://github.com/dougsillars for a great example. This isn’t the best experience we can offer our users. Have you ever seen the following in your adb logcat? I/Choreographer(1200): Skipped 60 frames! 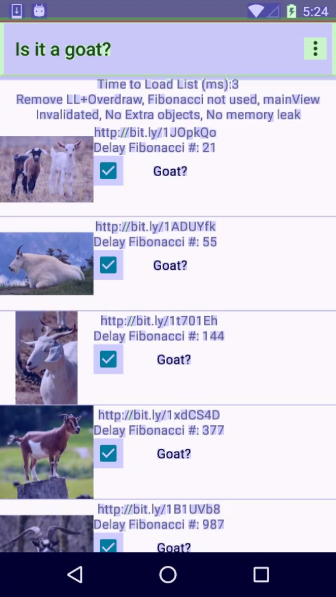 The application may be doing too much work on its main thread. 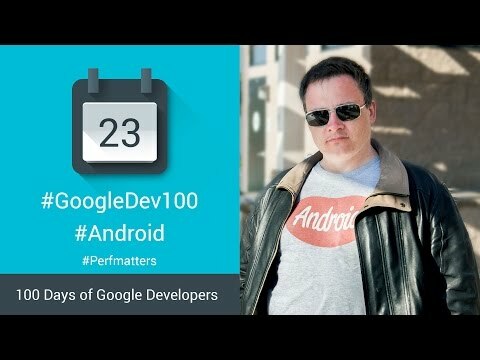 This is the Android Choreographer warning you in advance that your application is not performing to the buttery smooth experience we are aiming for. 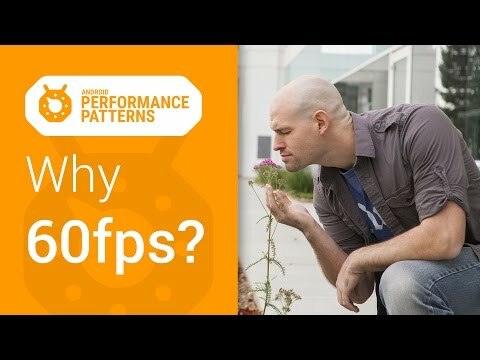 In fact it’s telling you that you are skipping frames and not providing your users a 60 FPS experience. We will need a few tips & tricks to resolve these issues. Measure overall UI performance with Systrace to get a baseline. Use Hierarchy Viewer to identify and flatten view hierarchies. Reduce overdraw by flattening layouts and drawing less pixels on screen. 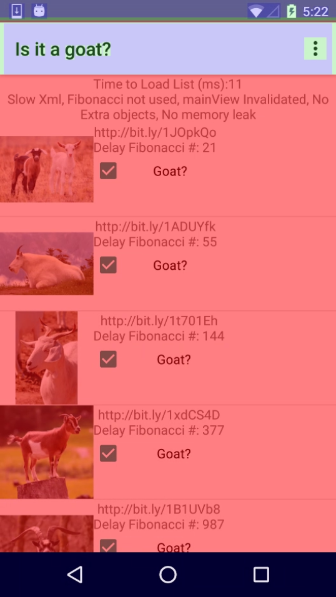 Enable StrictMode to identify and make fewer potentially blocking calls on the main UI thread. Numbers never lie, so it’s apparent we have a bit of Janky frames(~9%). Let’s dig in further with Systrace. Systrace gives you an overview of the whole android system and tells you what’s going on at specific intervals of time. Let’s start a systrace on our device. First open up Android Device Monitor to get started. 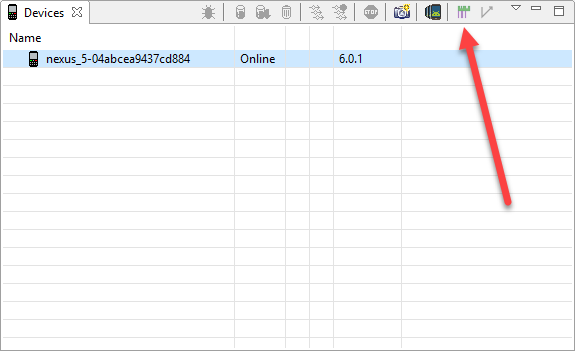 This will generate a trace.html file that will give us information about our system for the trace duration. Okay great! But what does this all mean? Let’s take it a step at a time. Alerts will give you a description of what the current situation is with a respective frame(s). It might let you know that there was a long View.OnDraw() call and it might give you suggestions on how you can fix the relevant frame(s). You can then dig straight into the frame. Finally you can mark that frame using the m hotkey and see what work is being done on various threads such as various CPU Threads, the UI Thread, and the RenderThread. This example is showing a Yellow Frame, but we can get a general idea of what an idea performant Frame might look like. For our Frame, we can see that our Adapter.GetView() should recycle the incoming View instead of creating a new one. Scheduling delays happen when the thread that is processing a specific slice was not scheduled on the CPU for a long amount of time. Thus it takes longer for this thread to fire up and complete. The amount of time that passed from the moment a slice is started until it’s finished. The amount of time the CPU spent processing that slice. Settings -> Developer Options -> Debug GPU overdraw -> Show overdraw areas. Once enabled, you will see many different colors on your layouts. 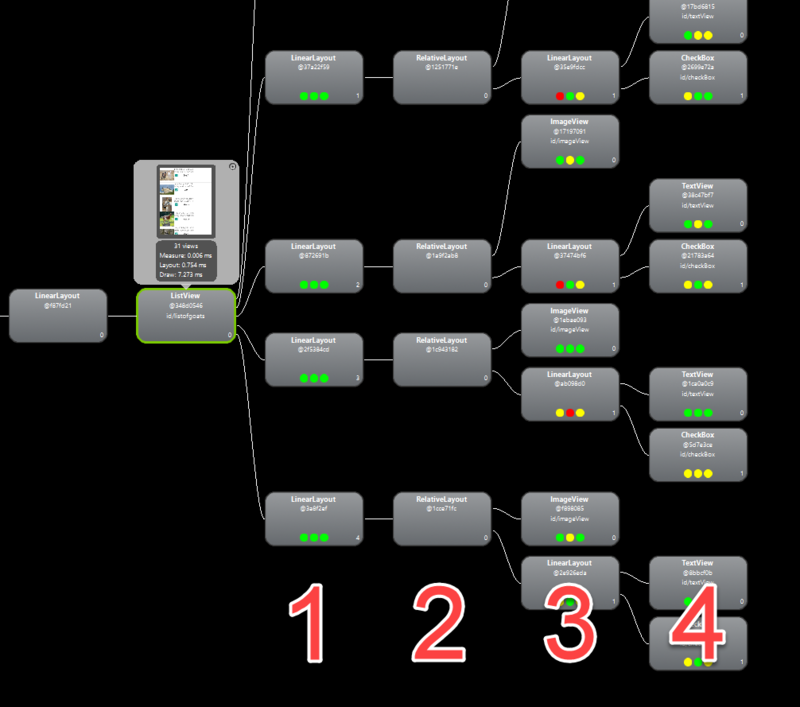 You can then identify why this layout might be overdrawing so much via a tool like Hierarchy Viewer. The first thing we want to know regarding our View Hierarchy is how deep or nested our layouts are. 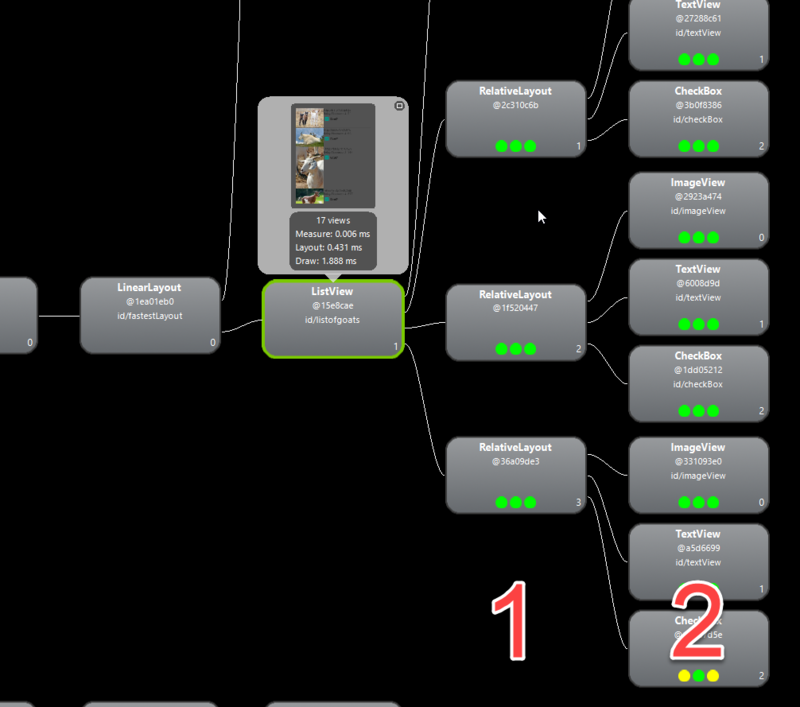 We can see that we are 4 layers deep which is less than ideal for our ListView. We really need to flatten this out. Okay that’s a little better! We are only 3 layers deep now. However it’s still not great. Let’s try to remove one more layer. Much better! 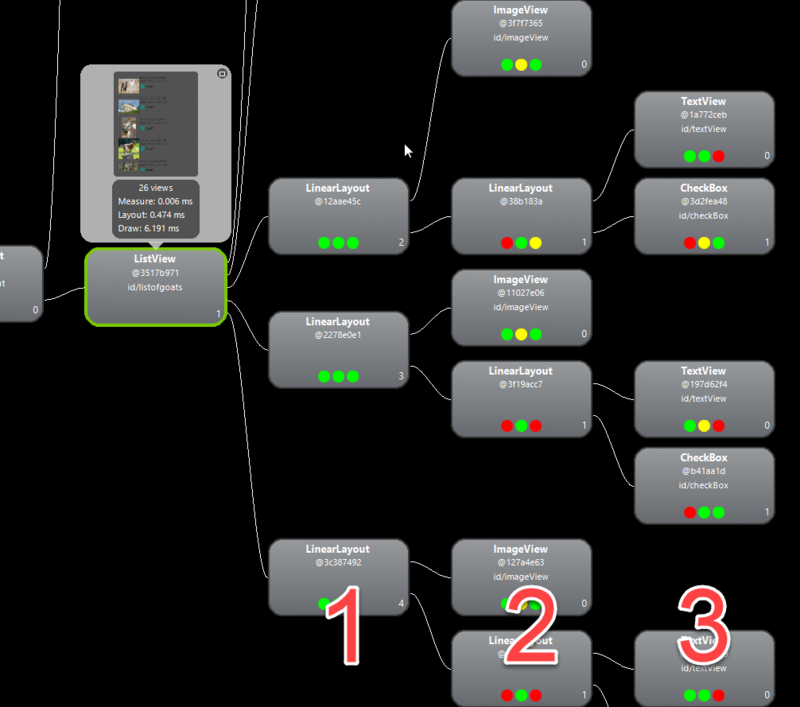 We just optimized our whole view hierarchy and we will reap the performance benefits. Let’s take a look at the overall Layout and Draw timings for proof. This can help you determine what type of policies you’d like to battle test your application with. There are a plethora of tools available to use on your Xamarin.Android application. Use them to track the important performance-related items about your application such as rendering performance to achieve a buttery smooth 60 fps experience for your customers. 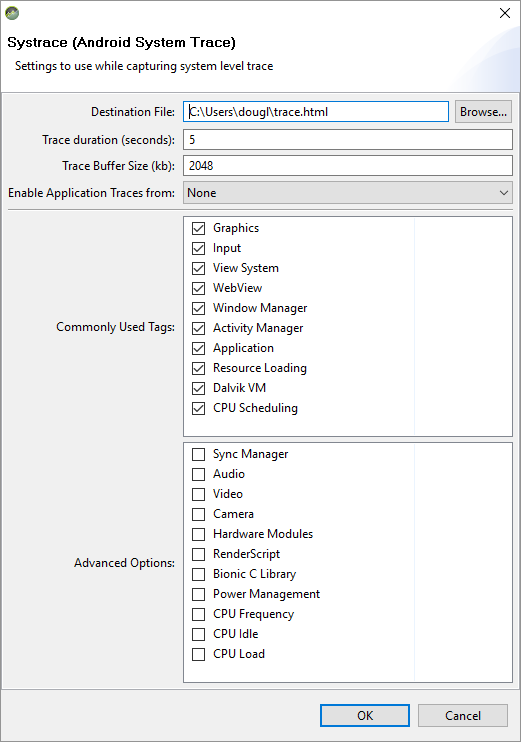 Use tools like Systrace, GPU overdraw, Hierarchy Viewer, and StrictMode to pinpoint performance related issues in your application and fix them.